Our annual 4th of July event will be sure to entertain like never before! Families will enjoy roving entertainment, inflatable bouncers, slides, and local bands will have you up and dancing on the main stage. Find your spot on the lawn then relax and enjoy the day before our spectacular fireworks show! ** NO BARBEQUES ** PARKING IS LIMITED SO BE SURE TO COME EARLY! Fireworks light the sky at 10:00pm SHARP! 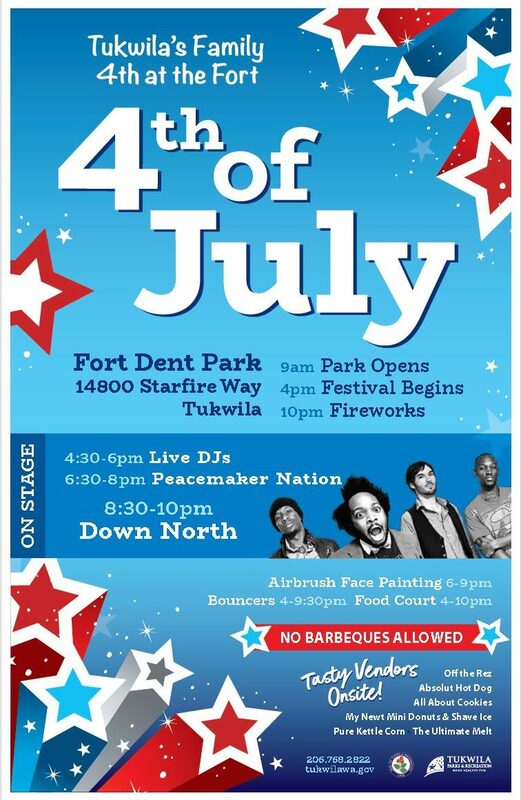 ** UPDATE: We’ve starting to see questions from the community as to why grills are no longer welcome at the annual Fourth of July event at Fort Dent Park, and wanted to let everyone know the reasons why. During our years of hosting this event, we’ve had several grill-related incidents, including folks disposing of hot coals in the garbage, in the grass or in the bushes; pathways being blocked with grills; and smoke impacting/bothering other park patrons. Obviously, our biggest concern is fires and the risk of people being burned by discarded coals. Because small fires have occurred in the past, we are now enforcing the no-grill rule this year. We are working hard to disseminate this rule change so that folks will know ahead of time to pack a picnic meal or plan to visit one of the food vendors (which will include BBQ! ).